Julia and her adopted brother, David, are sixteen-years-old. Julia is white. David is black. It is the mid-1980s and their family has just moved to rural Indiana, a landscape of cottonwood trees, trailer parks, and an all-encompassing racism. At home are a distant mother--more involved with her church's missionaries than her own children--and a violent father. 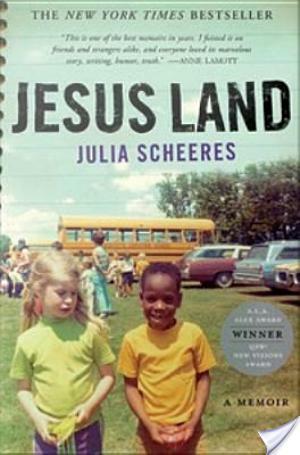 In this riveting and heartrending memoir Julia Scheeres takes us from the Midwest to a place beyond imagining: surrounded by natural beauty, the Escuela Caribe--a religious reform school in the Dominican Republic--is characterized by a disciplinary regime that extracts repentance from its students by any means necessary. Julia and David strive to make it through these ordeals and their tale is relayed here with startling immediacy, extreme candor, and wry humor. Sometimes, I just need some non-fiction in my life. A while back,I listened to�A Thousand Lives by Julia Scheeres and really thought it was an excellent listen. When I came across�Jesus Land on Audible, I purchased it without even making the connection in my head that it was the same author. Eventually, after putting�The Prince Of Tides�on pause for now, I decided it was time to listen to�Jesus Land. I wanted a hard hitting non-fiction book with religious themes. Please note: This book is not the type that gets all preachy with religion or anything, so don’t avoid it for that reason. Honestly, after finishing this audiobook, I went online to look up the school and Scheeres. I found myself landing down this rabbit hole and reading the entirety of an Ask Me Anything on Reddit with Scheeres. To me, that’s the mark of good non-fiction and good writing, when I find myself in a research spiral after reading the book. The same thing happened after I listened to�A Thousand Lives. I did discover in my search that Scheeres does not seem to have another book coming out soon for my liking. I have to also say that this book made me emotional. I found myself very upset and angry while listening. I think that for a non-fiction memoir to provoke such feelings in me is a sign that the book is REALLY, REALLY good. When I started this, I was expecting narration similar to Robin Miles, she’s the narrator of�A Thousand Lives. However, the narrator of�Jesus Land, Elizabeth Evans, is totally different. She does not sound academic or like a professor at all. Instead, she sounds like a regular girl just recounting her story to us. I thought she sounded authentic and like she embodied the words of Scheeres’ memoir. Her voice is pitched a bit higher, but I liked it. She has good pacing, diction and tone. The production quality is very on par with what I enjoy when I listen to audios, meaning it’s crisp and clear with no weird pauses or feedback. I think I’m going to give this a shot. I’ve been reading a little bit too much fiction lately, and I need some non-fiction right now. It sounds really interesting. I’ve never really listened to audiobooks, but I’m thinking this might be a good book to start with. You should definitely check it out, Iris. Jesusland is really, really intense and sad and good. I also would recommend her audiobook of A Thousand Lives which is non-fiction about Jim Jones and Jonestown.